Genesis Vision is aiming to rewrite the playbook for ICO investing with its new token sale and initiative. With markets more volatile and unstable as ever the days of methodic and passive gains from investments appear to be nonexistent. For investors opting for a stable sort of income that continues to grow, engaging in initial coin offerings (ICOs) has proved to be a useful way to circumvent variance and periodic swings of volatility. As is the case with many forms of investment, steady and passive gains typically are somewhat lacking relative to more dynamic means. There is a reason that investors seldom flock to banking products with guaranteed rates of return such as bonds, CDs, or other fixed-income instruments. Participating in ICOs represents a bridge between two extremes, as investors gain access to a more stable source of growth without such nascent returns. This does not mean that ICOs are a panacea for all investors, though diligent research coupled with an understanding of how a given company plans to operate is key. In 2017, ICOs have exploded in popularity, rising in tandem with the prices of Bitcoin, Ethereum, and other cryptocurrencies. Having recently traded at all-time highs, many companies and startup groups have turned to ICOs as a vehicle for investment to jumpstart their operations or development. While its too early to say that ICOs have supplanted traditional initial public offerings (IPO), it is not a stretch to say that ICOs have been catapulted to the forefront of the financial services industry. For this reason, its important to sift past marketing gimmicks and schemes, as there are no shortage of ICO options out there. ICOs are not as intimidating as they sound at first glance. More broadly defined, an ICO is a process of financing projects via the issuance of cryptocurrency or cryptotoken. The main idea behind an ICO or token investment are that the token value grows if the project is successful, much like a common stock or equity in traditional securities market. It is important to note that the ICO market is growing extremely fast presently. The strength of ICOs is that everyone can invest, nor does it prohibit individuals in the same ways that IPOs do. Investors are often times excluded from the biggest IPOs, with access to certain companies being reserved for only a minority of individuals – ICOs are the opposite. As a transparent way of getting support for a given company, ICOs are open for everybody. Investors can freely trade tokens after simply signing up and funding an account. Unlike other forms of investment, ICOs also do not require entangling paperwork or fees. Moreover, the limits for minimum investment are very lax – usually, the investment can be as low as $5, making it viable for all forms of investors. The window for ICOs is typically very short as all unsold coins are burned. After a short token sale, coins are placed on numerous exchanges and from this moment their price is defined by the market and fluctuates freely. However, only during ICOs do all coins have a fixed price, creating an exciting and rewarding opportunity for investors. Ultimately, transparency lies at the heart of any successful ICO – this is easier said than done, with ICO whitepapers offering a wide range of information for investors. At Genesis Vision however, the group emphasizes education in ICOs as well as engaging in client assistance. Genesis Vision has a change to become the first ever ICO of its kind. The group’s ICO is slated for October 15, representing a bid to kickstart the disruption of the trust management market. In anticipation of this event, the group initiated an options sale last week guaranteeing Genesis Vision Tokens (GVT) at a specified price, also extending a range of incentives for investors. The options sale will allow investors to buy token that will entitle its holder to a purchase a certain amount of GVT at a fixed price. The group believes this sale will help streamline the overall ICO process, making it more convenient. This will also help reduce the likelihood of an Ethereum network overload, which is caused by heavy influx of transactions in a very short time range, a common occurrence. What is Genesis Vision trying to accomplish? The project behind Genesis Visions’ ICO is a fully decentralized, open-source platform for managing assets. Contrary to what people may think, the ICO process is not an unregulated free for all. There are multiple organizations that offer ICO certification and help investors rate an ICO, projecting the future value of coins to avoid scams. Genesis Vision has garnered this same certification, helping instill confidence in its ICO and future operations. Earlier this month, the Financial Commission’s Initial Coin Offering Certification Committee (ICC) division approved Genesis Vision’s ICO initiative. The certification status followed after a rigorous review of its planned ICO, which included its business and proposed platform. By extension, there are many that believe ICOs do not require any regulation. Just like the blockchain concept itself, the process is tightly regulated by the technology itself, as well as fundamental laws of economics. There is no possibility of your coins getting lost or stolen, the system is secure and runs on top of renowned Ethereum ecosystem. The technology itself – smart contracts – is a cryptography-driven, tamper-proof guarantee against any fraud. Therefore, Genesis Vision trading system doesn’t need any trusted party to move your funds, you can freely and reliably invest and withdraw your assets using the Ethereum blockchain. Genesis Vision is expecting a sharp increase in the value of GVT after its initial sale that is currently ongoing. GVT tokens are in essence a universal utility to fund your account: if you want to invest using Genesis Vision platform, you have to acquire GVT first, as it is the only medium to buy individual manager tokens, which are used for any investment on the platform. 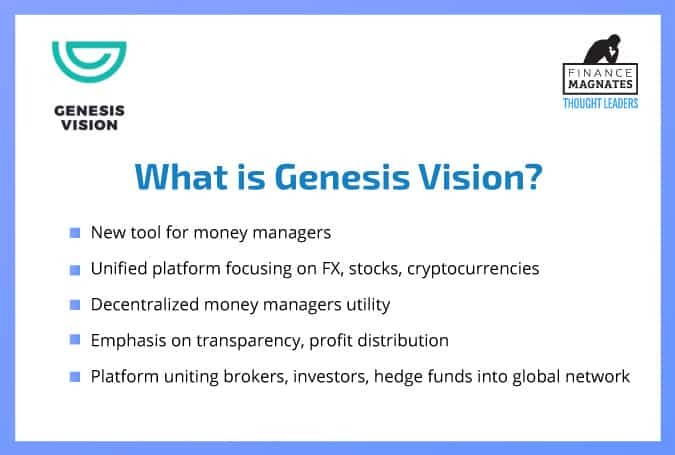 With a minimum payment of just $5, Genesis Vision is open to all investors. Individuals interested in the bonus options or Genesis Vision’s platform are invited to read the whitepaper covering its ICO and all other elements of its development. Its ongoing options sale will ultimately pave the way for an October launch of Genesis Vision via a landmark ICO campaign.